"About that tampon - not cool." What message does a tampon stuck to your back even communicate? Absorb me? Menstruate me? People are jerks? 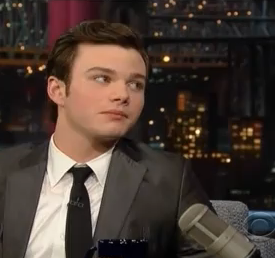 Clovis California’s golden(globe) boy, Chris Colfer popped by The Late Show to chat with David Letterman last night about cow-tipping, Spider-Man, and wait for it…Bullies! Funny, it sounds kind of fun to us, too!